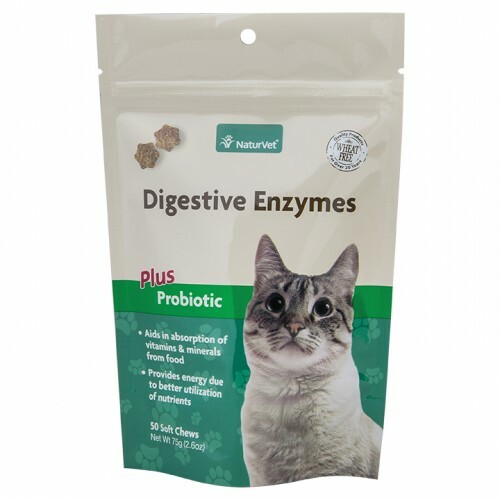 NaturVet® Digestive Enzymes Plus Probiotics help to unlock vitamins, minerals and other important nutrients from food for optimal absorption. Great for food transitioning. For use in cats over the age of 12 weeks. 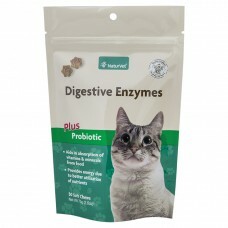 Give 2 soft chews per meal, up to 4 soft chews per day. Brewer's Dried Yeast, Dried Potato Product, Glycerin, Flaxseed, Lecithin, Canola Oil, Fructooligosaccharide, Dried Aspergillus oryzae Fermentation Product, Dried Aspergillus niger Fermentation Solubles, Trichoderma longibrachiatum, Carica papaya, Dried Bacillus coagulans Fermentation Product, Deionized Water, Natural Flavoring, Tapioca Starch, Sorbic Acid (a preservative), Mixed Tocopherols (a preservative), Rosemary Extract, and Vegetable Oil.